These Adventurous Kittens Prove Cats Are Man's Best Friend Too! We all love adorable pet stories, and this latest tale is a heartwarming one that includes KITTENS - AWWW! Kayleen VanderRee and Danielle Gumbley, from British Columbia in Canada, were preparing for a weekend of outdoor adventures when they heard cries coming from behind some nearby dustbins. The pair went to investigate and were shocked to find two tiny, and clearly abandoned, little kittens purring for help. Not wanting to leave them behind but knowing that the nearest animal shelter was closed, the friends decided to take the two little cats on their outdoor adventure trip with them. The little things took to the adventure lifestyle like ducks to water and since that first trip in which Danielle and Kayleen carried the kittens the whole time, theve never looked back! They're such regulars on hiking and adventure trips that they even have explorer names! 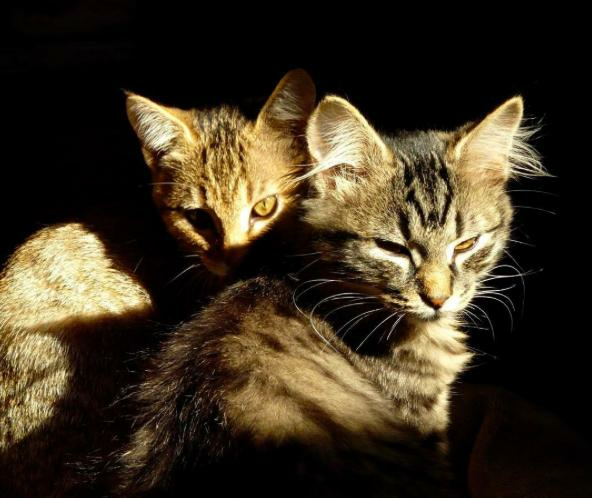 One kitten is called Bolt after a piece if climbing equipment and also due to the lighting shaped mark on his tail, and the other is called Keel as in the part of a sailing boat. Bolt and Keel have not only become the ultimate feline explorers, but also huge Instagram stars with over 53,000 followers keeping up to date with their latest expeditions. It's no surprise, the pictures of the on boats, in tents and poking their heads out of waterproof jackets are too adorable to miss. Watch out dog lovers, cats can be the ultimate partner in crime too!